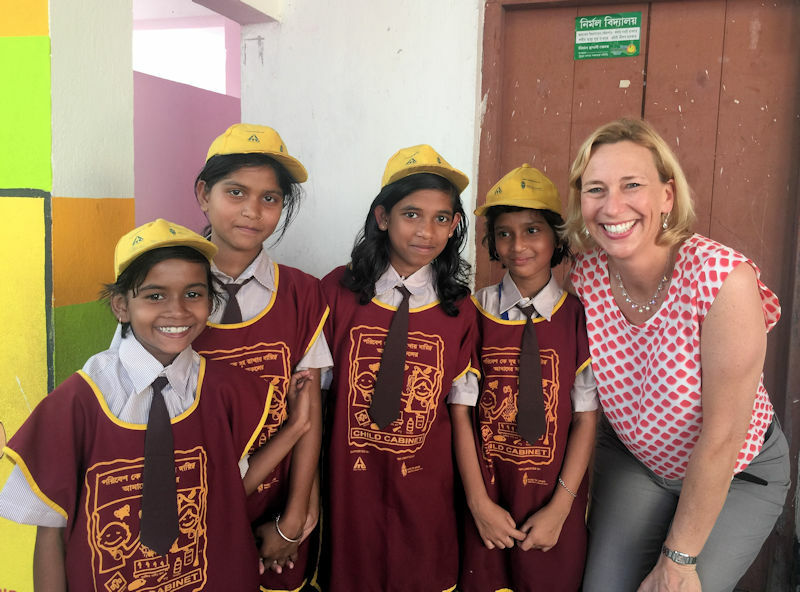 As part of Water for People’s (Denver) work in India, girls learn about the importance of proper water and sanitation and positively affect their communities. Photo courtesy of Water for People. Eleanor Allen has had a hand in designing and improving water resource recovery facilities in cities around the world during her more than 25 years as a wastewater engineer, project manager, and water-sector executive. But her skills as a leader and technical expert are not the only reasons Allen was recognized as a 2017 Water Environment Federation (WEF; Alexandria, Va.) Fellow, a designation that celebrates groundbreaking contributions to the water profession by WEF members. As CEO of the nonprofit organization Water for People (Denver, Colo.), Allen works to secure high-quality drinking water and sanitation services in nine countries in Latin America, Africa, and Asia. 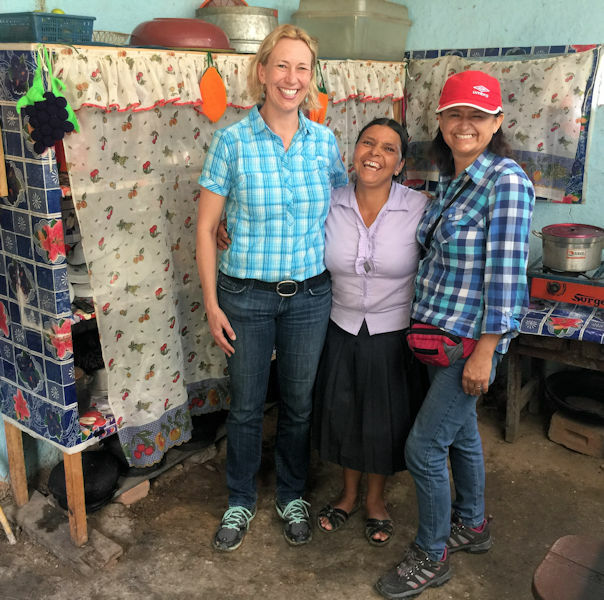 Through her humanitarian and advocacy efforts, which include stints as a U.S. Peace Corps volunteer and a TEDx Talk speaker, she has devoted her career to making water services — and the water profession — more accessible. Allen visits locals in Peru, one of the countries where Water for People works to improve access to clean water and sanitation. Photo courtesy of Water for People. Allen’s career has taken her around the globe. After receiving her undergraduate degree from Tufts University (Medford, Mass.) and working as a project engineer in Redmond, Wash., she joined the U.S. Peace Corps in 1994. She spent 2 years in the Dominican Republic working on water and sanitation issues before returning to the states for graduate school at the University of California, Berkeley. Ensuing roles as an engineer and manager brought Allen to Seattle, Puerto Rico, Denver, Brazil, and the Netherlands, climbing the professional ladder at engineering firms such as Jacobs/CH2M (Englewood, Colo.) and Arcadis (Amsterdam). Just before becoming CEO of Water for People in 2015, Allen led Arcadis’ global water business, managing a global network of around 3000 employees. “Only 36% of the world has sewers, and worse yet only 27% of the sewers go to wastewater treatment plants. I spent the first half of my career designing beautiful wastewater treatment plants in cities around the world for this fortunate minority,” Allen said. Currently, she is working to provide onsite sanitation services to the 64% of the world that does not have access to sewers, she said. 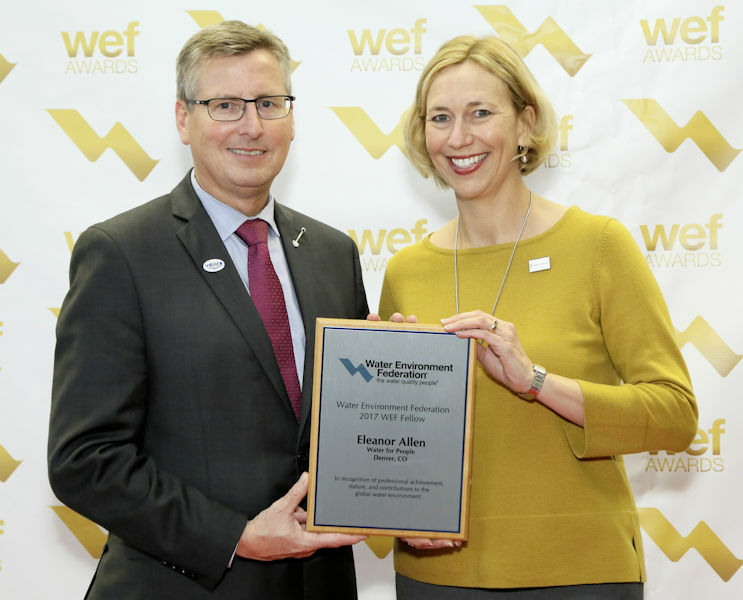 Eleanor Allen receives the 2017 Water Environment Federation (WEF; Alexandria, Va.) Fellow designation plaque from Rick Warner, 2016–2017 WEF President, during WEFTEC 2017. Photo courtesy of Oscar & Associates. Allen has remained active in numerous professional organizations. 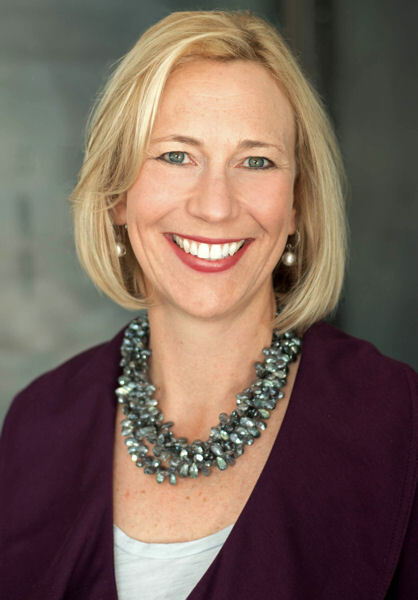 She joined WEF in 1996 and, at different times, has been a member of the California Water Environment Association, Pacific Northwest Clean Water Association, and the Puerto Rico Water and Environment Association. She also is involved with the American Water Works Association (Denver), the International Water Association (The Hague, Netherlands), and the American Academy of Engineers and Scientists (Annapolis, Md.). In addition, she serves on the Forbes Nonprofit Council, the Board of Directors at Parametrix (Seattle), and is a Schwab Foundation (Geneva) Social Entrepreneur. “They have all affected my career path by allowing me to be a part of a supporting and vibrant community of professionals, and also by providing a resource center for knowledge,” Allen said. Allen received 2017 WEF Fellow designation for her contributions to WEF and work to increase water and sanitation services around the world. Photo courtesy of Allen. Allen appeared at the 2016 TEDxMileHigh conference in Denver. She spoke about how improving water and sanitation in the developing world uplifts women and why women are often more invested than men in water quality and security. “Women have a vested interest in improving the quality of life in their communities, and they often understand the details of water and sanitation better than the men because it affects their lives much more directly,” Allen said. Water for People often works in areas without water services. Allen and her team train new workforces for the water authorities and service providers they help create. They encourage gender parity at the ground level. Allen believes that water professionals around the world could learn from example by seeing a greater proportion of women empowered to work in water, she said. The Water Environment Federation (WEF; Alexandria, Va.) Fellows program recognizes the professional achievements and contributions WEF members have made to the preservation and enhancement of the global water environment in practice areas served by the organization. In 2017, WEF bestowed this honor on 11 individuals. See a video featuring interviews of the 2017 WEF Fellows. Each of these recipients will be featured in future issues of WEF Highlights. Follow these stories with the keyword WEFFellows17.